The journey from the cotton field to the handloom fabric is one of Andhra Pradesh’s most well known – the journey of many journeys: from fields to spinning wheels, from the white of cotton to nature’s blues, greys and yellows; many yarns to one elaborate warp, the warp that then makes it to the loom. The skylight falls on the loom as the shuttle moves across in rhythmic continuity. 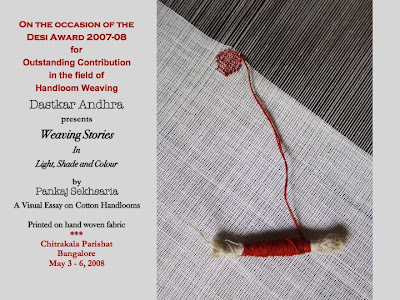 The eyes focus, the foot moves and then the hand; thread by single cotton thread, the weft merges effortlessly with the warp – two identities dissolve magically into a third and a skilled old master might also add the extra weft for that intricate jamdani. Craft, technology, tradition, family, livelihood…Weaving is all this and much more.